Youth Athletes - Stretching – When and What type – Youth Sport Nutrition Ltd.
For many years, we have believed that long static stretching is the ideal method to warm up before competition or gym sessions. However, over the past number of years it has been discovered that this can have a negative effect on muscular performance. This blog will provide you with the knowledge to implement different stretching techniques into you training programme. Stretching is a method used by all to help improve flexibility, which is a measure of range of motion (ROM). This can be done through both static stretching and dynamic stretching. Static stretching, also known as passive stretching, is a slow and constant movement held for an extended period of time, usually up to 30 seconds. It requires little movement and only external forces such as gravity, our ow body weight or a partner supply the force to create a stretch or lengthening of the muscle. The main advantage of static stretching is an improved ROM in the muscle. On the other hand, dynamic stretching, also known as active stretching, involves constant movement and therefore requires voluntary muscular actions. The dynamic stretch is a functionally based stretching exercise that uses sport-specific movement patterns to prepare the body for activity. For example, a walking knee lift stretch mimics the movement pattern of a sprinter, or a leg swing mimics the shooting action of a footballer and therefore should be incorporated into their respective warm ups. This type of stretch requires a larger amount of mobility and targets groups of muscles rather than just the one as a static stretch would. Key Differences: (i) Dynamic ROM is generally greater than static ROM; (ii) During a dynamic stretch the muscle(s) do not relax during the stretch as it does in a static stretch, but instead is active through the ROM. When should you do dynamic stretching and when to do static stretching? 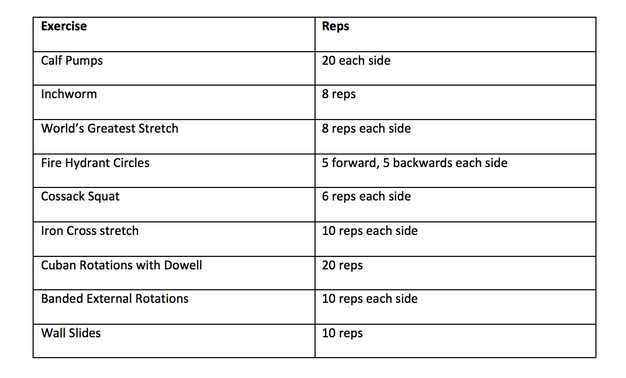 Let’s start with dynamic stretching. If you are about to step on a field to train, compete or lift weights then dynamic stretching is a must. As part of the warm up protocol you should start with a pulse raiser that will mimic the sport/ session you are about to do. 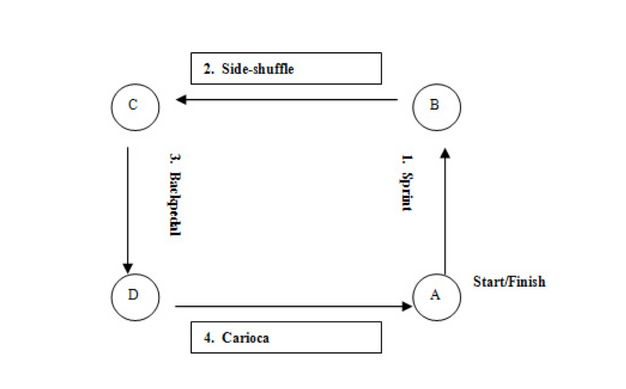 For example, if you are about to compete in a football match, use a box drill where you would shuffle, backpedal, turn and sprint from cone to cone, all of which which is related to the multi directional aspect of football. Following this pulse raiser, you need to incorporate dynamic movements into the warm up which mimic the movement patterns of the sport as mentioned above. The goal here is to activate and mobilise the muscles and joints. Furthermore, as dynamic stretching involves active movements, it increases blood flow to the muscles which helps with improve range of motion and also increases body temperature. It has been proven that an increase of 1 degree Celsius in the body leads to 4% improvements in power and strength production (Kilduff et al., 2013). Quick Tip: Always wear a jacket and jumper in warm ups for as long as you can. You should never be cold as this can lead to a decrease in performance and increased chance of injury. 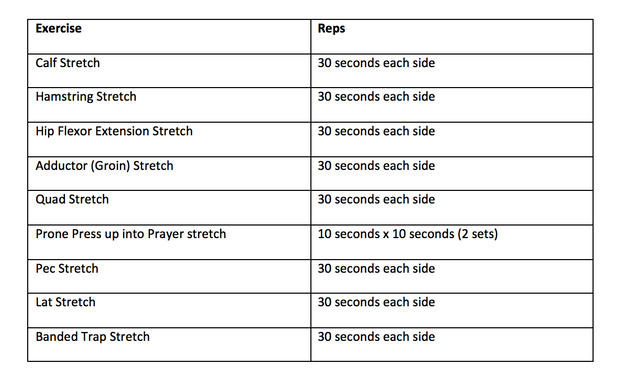 Although it is widely acknowledged that static stretching relaxes the muscle, it is still seen in almost every warm up. Static stretching in simple terms ‘puts the muscle to sleep’ due to the length tension relationship. If incorporated in a warm up, stretches held for upto 30 seconds and over are found to have a negative outcome on muscular performance. Specifically, a reduced force production. In contrast, if static stretching is added at the end of training or competition, it can lead to reduction in delayed onset of muscle soreness (DOMS) and long term improvements in the ROM of the muscle if performed consistently. Ideally this will be immediately after to produce the optimal effect and avail of the additional ROM due to the temperature of the muscle. Therefore, it is suggested static stretching should be incorporated at the end of competition or session. Side Note: However, for example, if an athlete cannot perform an exercise due to lack of ROM or flexibility which in turn will hinder the session ahead, by all means do what needs to be done to get the exercise completed. Although, do try and keep it to less than 30 seconds. Josh Cowan holds a MSc. in Strength & Conditioning and is the head Strength & Conditioning practitioner at Harefield Sports Academy. He was also a volunteer sports coach at the Special Olympics and served time as an S&C intern for Saracens RFC. Kilduff, L., Finn, C., Baker, J., Cook, C. and West, D. (2013) ‘Preconditioning strategies to enhance physical performance on the day of competition’, International journal of sports physiology and performance., 8(6), pp. 677–81.